ABC “The View” co-host Meghan McCain pretty much gets a free pass on anything short of giving Joy Behar a wedgie right now. 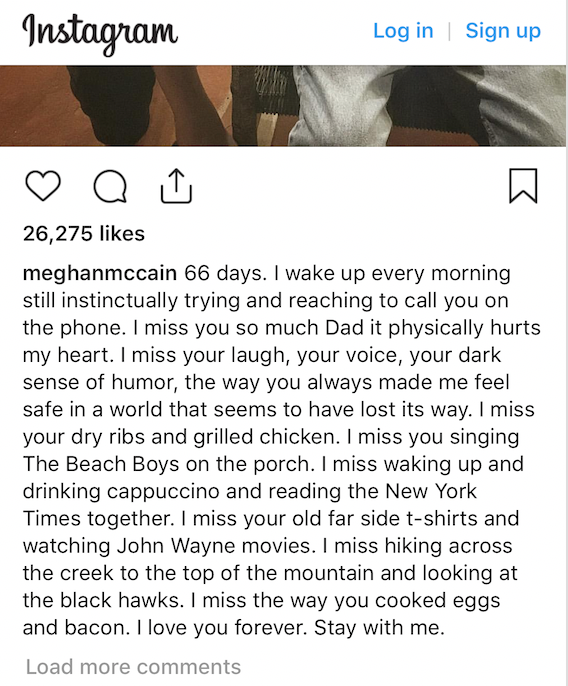 Each day, she counts the number of days that have passed since her father, Sen. John McCain‘s (R-Ariz.), death. Sometimes she recounts a memory. Mostly she just shares just how goddamn hard it is to live without him. Many of her followers are on board with the public display of the depth of her sadness. As you can see, some 26,000 people liked her outpouring of grief. But occasionally there’s an ant in the ointment. The complainer isn’t entirely coherent, but you get the idea. I despise the concept of counting “likes” and “retweets.” But the idiot got some 2,000 likes and 94 retweets. To her credit, Meghan actually remained exceptionally cool and calm in her response. However, she didn’t remain so calm when The Raw Story recently tried to portray her as a lush and misstate her stance on the recent bomb threats.